Hello everyone and welcome back to the I Geek Books blog. If you want to listen to this review click Here. For a couple of days now I have been looking up online (YouTube, believe it or not) for more books to read. I felt like something new was in order for me. A story that will be like no other I had ever read before, and boy did I found it! It seemed like there was a consensus about it online and that was that it was a good book and more over, a good series. Of course this caught my attention and when I looked it up it turned out that my library had i available, and whats more, they had the Audiobook version of it. The book was a lot more that I was expecting. Not only did the author created a new world where much of what we today imagine does come to pass, but a whole new take on the story of Cinderella, one that I personally like a lot. Now if you don’t like spoilers these is where you stop reading and go on to what ever platform you prefer and purchase said book. If those bloggers and other reviews you have read were not enough I hope this one has been, believe me, you are in for a treat; and for those of you who want more details than what the back cover provides, the hang on to your seats, here goes. 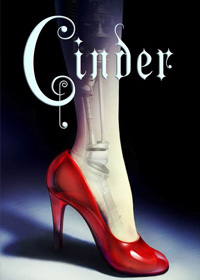 Cinder – Cinderella The Kindle editor offer the first 5 chapters for Free. * Para todos aquellos lectores en español estas crónicas lunares también están en amazon en español, aquí le dejo el Link: Crónicas Lunares de Marissa Meyer. Cinder is a cyborg. Yes you read right (talk about a spin-off from the classical story, right?!) a cyborg. She was adopted and her father, the one who wanted her died of a plague that has earth’s citizens in a panic, leaving her with the evil step sister, the not so evil step sister and the very evil (you want to choke, yell and scratch at) stepmother. There is also of course, a very noble prince soon to be emperor and another entity that adds up to the story and the development of it, Queen Levana. Regent sovereign of the Moon. This all takes place in New Beijing, many years after today’s date when so much has happened to change civilization as we know it. I also loved that the way it’s narrated it gives the reader all the information. From the beginning I knew who she was. What she was supposed to be, who she is and she does not know it. Hidden in plain sight and yet no one could find her. That was brilliant. My least favorite part however, was the end. Not because it was bad, but because it’s a cliff hanger. The good thing is; there is a following book in The Lunar Chronicles and this Book Geek is logged into her library account right now putting a hold on that book right now, I can’t wait to see what the next book has in stock for me. I love it when I am pleasantly surprised, and this book surprised me on all levels. It checks all my must haves. Good writing, great story, good story line and progress for readers. Strong characters that you can emphasize with and lots of little details I can’t wait to explore. Right when you think nothing else could go wrong, well, that’s when you are wrong… I have to say, I love books like this that make me want to trow my reading list away and read this until my eyes hurt, I am sleep deprived (but happy) and completely finished with it. How ever, I will try to control myself (mostly because I am on a wait list for the second book) and keep to my list. I will definitely be posting more as I progress, I am very exited for this Chronicles and I hope you will give them a try if you have not done so yet.